10' x 8' x 8'6"
20' x 8' x 9'6"
9'3" x 7'8" x 7'10"
19'3" x 7'8" x 7'10"
19'3" x 7'8" x 8'10"
39'5" x 7'8" x 8'10"
*All dimensions and weights are approximate as containers vary from manufacturer to manufacturer. Check out our container capacity chart for information about internal volume and storage capacity. We know that you need your structures to be secure, durable, and portable, which is why we build our wide range of standard portable storage, office, and housing structures using standard 20- or 40- foot Conex (ISO) shipping containers. 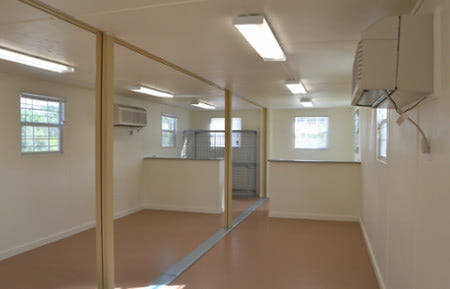 We also make custom structures with standard and 10-foot shipping containers. 16 gauge vertically corrugated corten steel. Double, asymmetrical steel doors with ground-level entry. While 20-foot and 40-foot shipping containers are the norm, the age and condition of shipping containers vary greatly. At Falcon Structures, most of the containers we modify and sell fall into the “One Trip” or “new” category. One Trip containers have literally made only one trip from China to the U.S. and are the best option for living and working spaces. 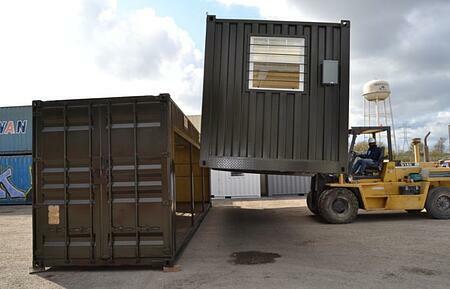 Falcon Structures also offers used shipping containers – those that have made several trips by land or sea – but we only recommend this option for limited applications. Since we always choose containers with modification in mind, we only offer certified, wind and watertight containers. While the concept of creating durable, standardized shipping containers originated in the United States, most shipping containers (also known as Conex or Connex containers, ISO containers, one trip containers, sea containers, ocean containers, ISBU containers, intermodal containers, etc.) are manufactured in China or Europe. To get to the U.S., shipping containers travel by sea and must meet strict ISO manufacturing standards set forth by the International Maritime Organization (IMO). These standards ensure any cargo stored inside is protected from harsh elements experienced at sea, including wind, rain, snow, ice, and heat. Once modified, containers provide a safe and sturdy environment suitable for storage, industrial enclosures, living quarters, office space, military solutions, and more. Ready to Take the Next Step? It’s easy! Call Falcon at 877-704-0177 with any questions or to discuss options with one of our friendly sale reps. 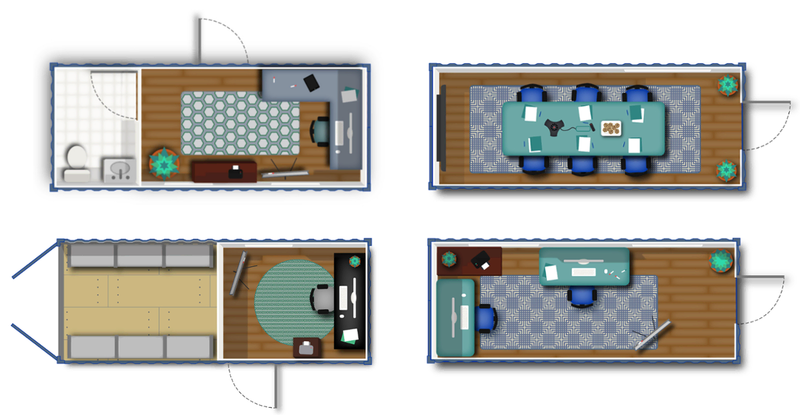 Check out this informative guide: 5 Steps to Designing Your Modified Shipping Container.